“I’m telling you, I’ve been so surprised! I have been so blown away and humbled by the generosity [of the people] and the beauty of this place,” says American actor Iam Somerhalder about his happy experience in the Philippines. 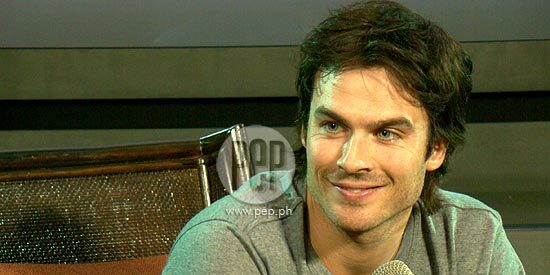 Ian Somerhalder had no idea about the beauty of the Philippines until he set foot in the country last Saturday, May 19. “This country, you know, it’s strange because I wasn’t aware that there are 7,000 beautiful islands in this country. “When you look at a map, you can’t grasp what exactly you’re gonna see,” he told the media and fans in an exclusive press conference prepared for him by Penshoppe earlier today, May 23, at the Peninsula Manila Hotel in Makati City. Ian, who is popular for playing Damon in the American TV series The Vampire Diaries, is the new addition to the “All Stars” endorsers of the local clothing brand. He visited the country to shoot its latest campaign, which happened in El Nido, Palawan earlier this week. During the photo shoot, Ian discovered that, “El Nido is probably one of the most beautiful places in the planet. “The people here, everyone was so profoundly wonderful, beautiful, intelligent, and soulful. “It’s such a phenomenal experience and I’m really, really, happy to be here. Because of his words about the Philippines, the media asked Ian what he would tell his friends about our country. Again he gushed, “I’m telling you, I’ve been so surprised! “I have been so blown away and humbled by the generosity [of the people] and the beauty of this place, and how progressive everything is. He also encouraged their loyal customers, “Get up for this advocacy and support his project. Ian was grateful to have been given this kind of support. He said, “You know, I’ve never heard about a brand linking up with a foundation to literally promote good, not just to promote but also to raise the monetary resources and to actually put it in motion. Ian also saw this new partnership to further their mission to educate people, especially the youth who are the primary customers of Penshoppe. Just like he thought about The Vampire Diaries, which is a hit to young audiences. “What I realized is, to use that exposure for the greater good and actually educate the youth of the world. “In my view, youth is the most under-used, under-appreciated, and under-valued group of people in the world. We do not put them to wheels of motion. We put them to wheels of education in motion. During his trip here, Ian found out that the Philippines is already doing something for the conservation and the preservation of the planet. “Big corporations are taking massive strives in contacting, preserving everything, from the resources that fall from the sky to resources that we create. “You guys are literally conserving in a corporate level, which no one does that and no one knows about that.